Newcastle-Upon-Tyne has long had a regular comic mart to go with its branches of Travelling Man and Forbidden Planet, but it has apparently been some fifteen years since it has had a big comics event. Small Press Big Mouth-er Stacey Whittle is about to change all that with a convention called The Canny Comic Con. Described as "a little festival of comics and sequential art" CCC will be at Newcastle's City Library on New Bridge Street West on Saturday 10 December 2011 beginning at 10am and will be free. Current plans include talks and panel discussions, workshops, and "a hall of stalls" and the guest list currently includes artists Bryan Talbot, Leonie O'Moore and Andrew Waugh. There are more details on The Canny Comic Con blog and Facebook page. There are more details about Newcastle City Library on its website. 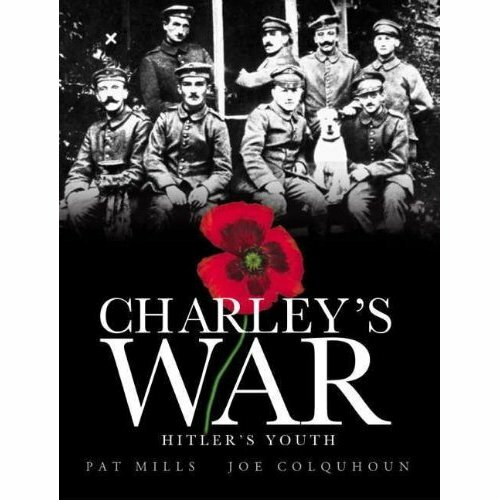 Having already given talks this year on Charley's War at the Imperial War Museum in London and the Edinburgh International Book Festival, writer and editor Pat Mills continues to discuss his World War One character at the The Tank Museum in one week's time. 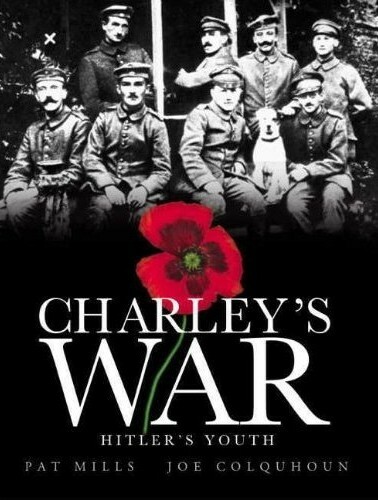 The talk will take place at 7:30pm on Saturday 22 October 2011 and tickets cost £10. The Tank Museum is at Bovington Army Camp near Wool in Dorset which is between Poole and Weymouth. 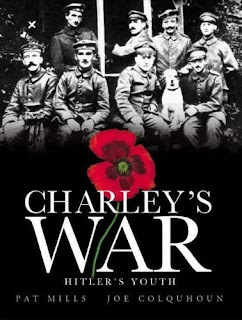 It is also worth noting that the eighth and latest Charley's War hardback from Titan, Hitler's Youth, is now being shipped by Amazon UK despite having a official release date of 28 October. There are more details of the museum, Pat Mills' talk and how to book tickets on The Tank Museum website. 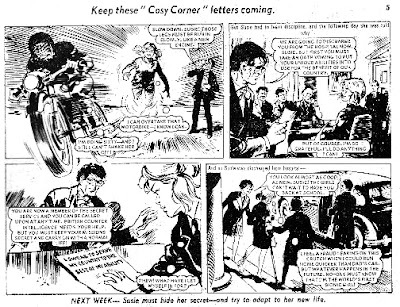 Two characters that were created for the first issue of Eagle comic in April 1950 have entered the British public's collective consciousness. The first is Eagle's most well known character, the spaceman Dan Dare, but the other, whilst well known, is rarely associated with Eagle. 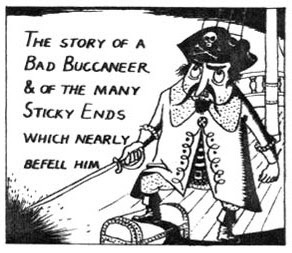 Artist John Ryan created the humorous pirate Captain Pugwash for that first issue of Eagle but his adventures there didn't last long and it was the transfer of the character into a limited animation black and white TV series on the BBC in 1957 that guaranteed his fame. Despite the comparative failure of Pugwash in Eagle, John Ryan's other Eagle character, the Extra Special Agent Harris Tweed, was popular with the comic's readers and Ryan would go on to create Lettuce Leefe for Girl and Sir Boldasbrass for Swift, both of which were sibling titles of Eagle. John Ryan passed away in 2009 but the Rye Art Gallery in his home town of Rye is about to celebrate his life and work with an exhibition of some 50 pieces of original artwork. This John Ryan Retrospective will open at 2pm on 19 November 2011 and run until 12 February 2012. There are more details on the John Ryan Retrospective on the Rye Art Gallery website which includes the opening times of the gallery. There are more details about John Ryan's work on the Eagle Times and Bear Alley blogs. 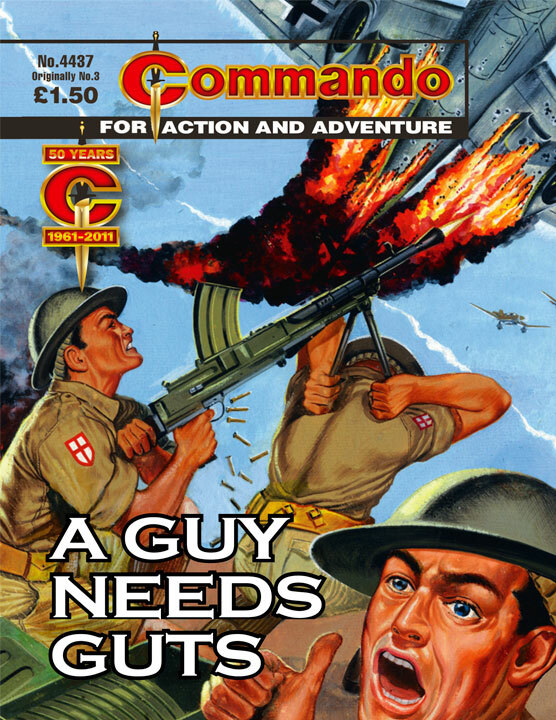 The latest issues of Commando are on sale in all ggod newsagents now, with this batch including a pair of books written by Eric Hebden and another by his son Alan - a first for the war comic perhaps. Railwaymen were in a reserved occupation during the Second World War as their particular skills were rated so highly. That didn’t mean they didn’t have to work hard or that they could dodge danger — there were always trains to haul and air raids a constant hazard. Driver Arthur Beckinshaw and his fireman Ernie Entwistle were two such men, happy that they were “doing their bit” even though they weren’t in uniform. Then they were sent to the Middle East where they found that engine driving was a lot more dangerous than they could ever have dreamt. A “Bullet Magnet” — a man whose actions seem to draw hot lead in his direction. Richard Cooper was such a man, his soldiering skills such that he often raised his head too high in a scrap. But this one-time actor was to discover that there was another kind of bullet magnet, a man set up to take the hits for another. And when he found out he realised that the magnet was him! North Africa, 1942. In the Western Desert, that vast cauldron of scorching heat and flaming lead, were forged the toughest fighting men ever known — the men they called the Desert Rats. And yet even they yielded pride of place to their truck drivers, those dare-devil fighting fools who, to keep vital supply lines open, blazed a trail of blood and glory across the Western Desert. "One of the most difficult things about finishing a Commando story is deciding on a title," notes Editor Calum Laird in his introduction to this reprint issue. "Often we’ll start with one that doesn’t fit the finished cover or, worst of all, has been used before. I’ve lost count of the number of time we’ve come up with a winning title only to consult the records and have to chalk it off. "When they titled Commando No 3, the field was much more open and buy did they make use of it! The cover artwork and that wording are a winning combination. "Inside the story backs up the title. Grit determination and guts writ large. It’s a pity I can’t use that wording again." A claymore from the days of Scottish clan warfare… a Japanese Samurai sword…and the kukri of a Gurkha soldier. 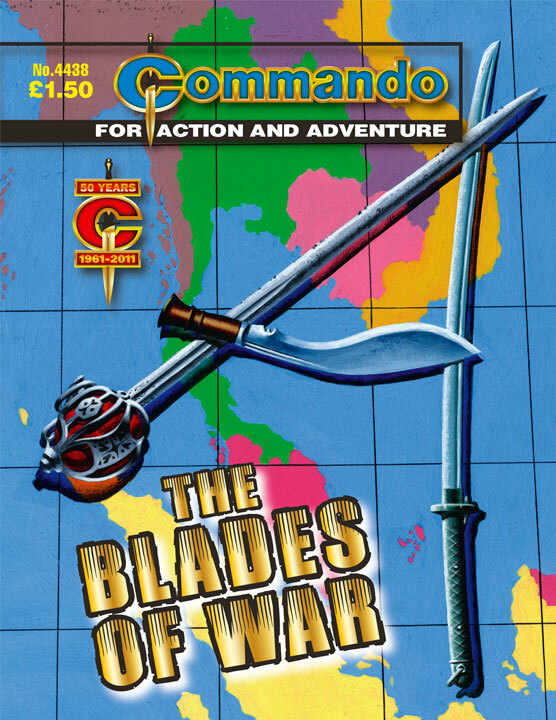 What was the strange bond that brought these blades together in the dark and hostile jungles of Burma? 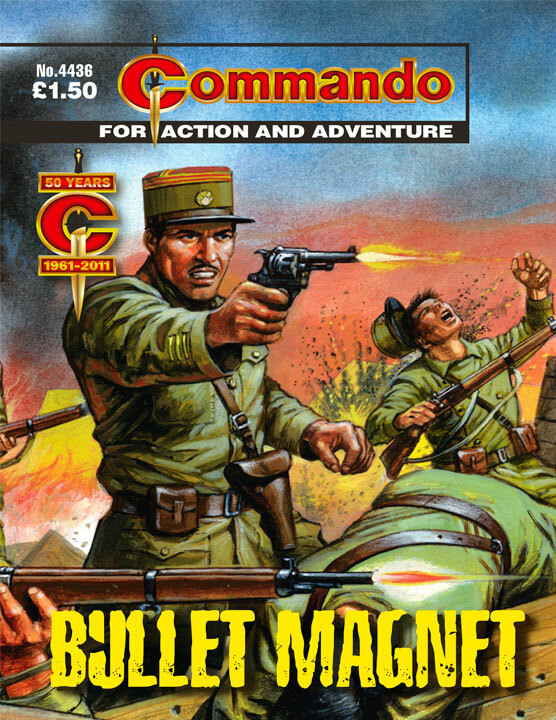 "Certain story themes, like the pursuit of revenge or redemption, have cropped up many times in Commando’s history, and our talented writers still manage to make them seem fresh," says Deputy Commando Editor Scott Montgomery of this story. "However, I’m pretty certain that this book is the only one where a Scotsman, a Gurkha and disgraced Japanese soldier join forces in the Burmese jungle to fight a common enemy. 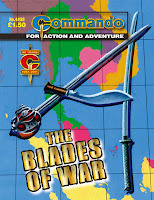 "It’s a tough, hard-hitting tale, this, but it is also a cracking read — a classic story of honour and vengeance, forged in the steel of battle…"
Commando may be best known for its one-off stories but it has run quite a few series over the years with recurring characters and situations. Perhaps the best known, mainly due to the sheer number of issues they have been in, are the British Army Special Raiding Force known as Ramsey's Raiders. The creative team behind the Raiders stories are writer Ferg Handley, internal artist Keith Page and cover artist Ian Kennedy. 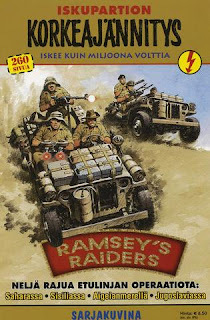 Ferg originally set the stories during World War II, beginning with the simply titled Ramsey's Raiders in issue 3854. There were another twelve Raiders books set during the war culminating in issue 3970 The Final Raid. 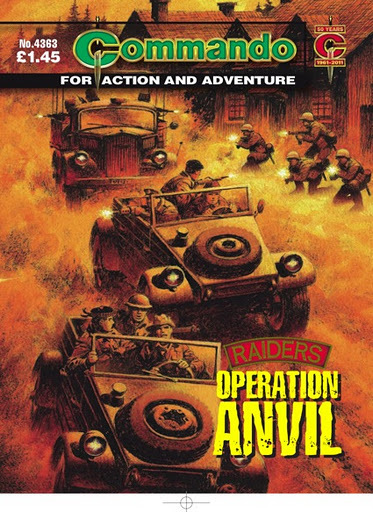 However since then the Raiders have been recalled into the world of the Cold War and have undertaken another six raids with the latest being issue 4363, Raiders - Operation Anvil. With so many Raiders tales to chose from it would seem an obvious choice for Carlton, who publish all the British Commando reprint books, to base at least one of their books around Ramsey's Raiders thereby giving the entire book a consistent theme and creative team. However that has yet to happen here in the UK. It has however already happened in Finland, where Commando is reprinted in the Korkeajännitys title, and they have produced at least one book which reprinted four Raiders stories. 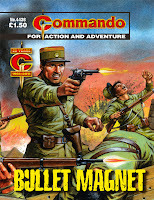 The Korkeajännitys publications are paperback books that reprint four Commando stories and as such are similar in format to the Manga paperbacks that are readily available in the UK. The latest country to release a Ramsey's Raiders book is Estonia with this new four-in-one reprint book entitled Komando which features the four Cold War Raiders stories, Raiders Recalled, Raiders On The Rampage, Raiders At The Ready and Raiders: The Reckoning. 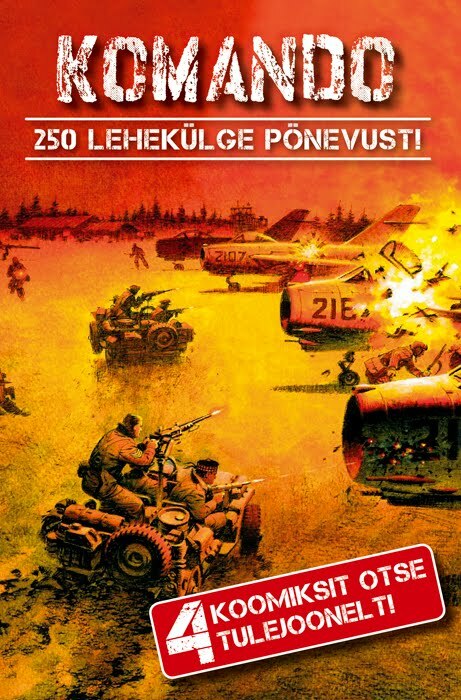 The cover used for the Estonian book is Raiders On The Rampage and there is something of a sweet irony that in a country that used to be part of the Soviet Union, the publisher chose to use the one cover out of the four possibilities that shows British servicemen attacking Soviet fighter jets. There are interviews with Ramsey's Raiders writer Ferg Handley and artist Keith Page on the downthetubes main site. 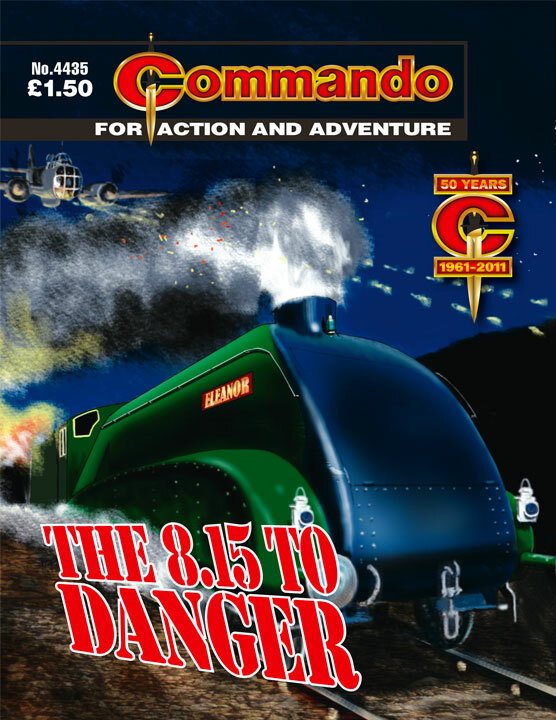 There are more details of Commando on the official DC Thomson Commando website. 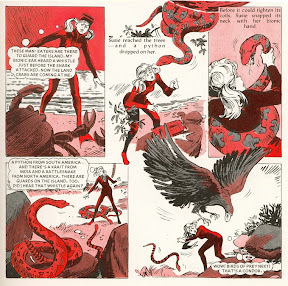 L Ashwell Wood was Eagle's premier cutaway artist providing over 600 different painted cutaways for the weekly comic between 1950 and 1969. While some of these paintings have been reused in the recent Eagle reprint books published by Orion to date none of Wood's original pencils for these Eagle cutaways have ever been published. 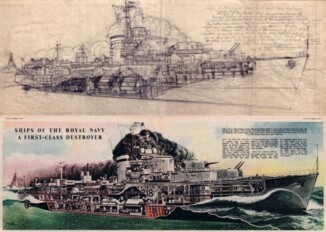 Earlier this year downthetubes' Jeremy Briggs discovered the pencils for L Ashwell Wood's cutaway of the Royal Navy destroyer HMS St Kitts which was published in Eagle Vol 1 No 46 dated 23 February 1951. These pencils are published for the first time, alongside the final version of the cutaway as printed in Eagle, as an A3 centrespread in the new issue of Eagle Times. 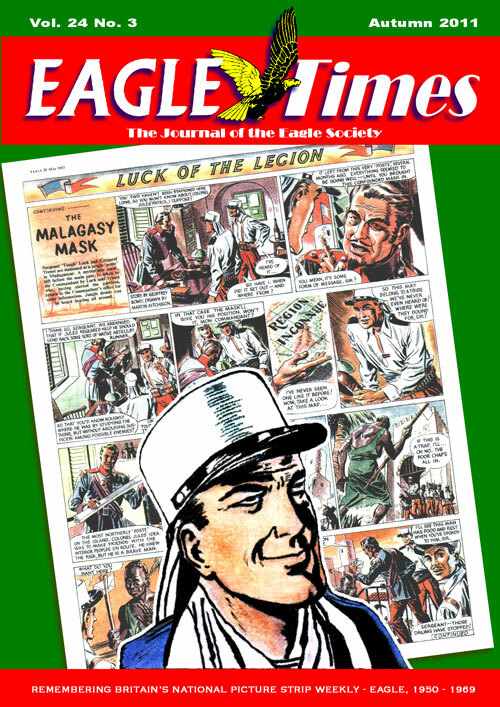 In addition to the centrespread, Jeremy supplies a detailed article on L Ashwell Wood's nineteen year career with Eagle comic. Amongst other features in this new issue of Britain's longest running comics fanzine are the first part of A Look at Luck examining Eagle's Luck of the Legion, the French Foreign Legion strip written by Geoffrey Bond and drawn by Martin Aitchison, an examination of the real XCH-4 hydrofoil which inspired Frank Hampson's hydrofoil designs in the Dan Dare story The Man From Nowhere, and writer Alan Vince's memories of working for David Hunt, the first editor of new Eagle in the 1980s. There are more details about Eagle Times Volume 24 Number 3 on the Eagle Times Blog. An annual subscription to Eagle Times magazine, which is published four times per year, is via membership to the Eagle Society. Details of how to subscribe are also on the Eagle Times Blog. A gigantic comic strip depiction of the Battle of Wakefield drawn and written by artist John Welding, previously shown at Wakefield Museum as part of their ‘Battle of Wakefield 1460’ Exhibition, can be seen at the University of Leeds until the end of the year. The Battle of Wakefield was fought at Sandal Magna near Wakefield, West Yorkshire in December 1460 and was part of the Wars of the Roses. The opposing sides were the Lancastrian army, loyal to the captive King Henry VI, and the army of Richard, Duke of York, the rival claimant to the throne. 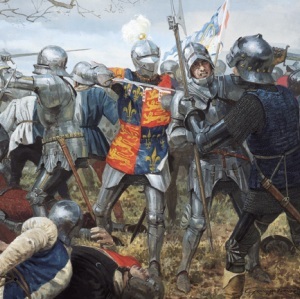 The battle resulted in the death of the Duke of York and the defeat of his army. Shown on large panels in the foyer area of the Parkinson Building (that's the main building at the University, with the clock tower) this graphic depiction of an important battle is well worth a look. Update 23 Oct - this display now seems to have vanished! Comic creator Steve Moore -- creator of such wonderful characters as Abslom Daak, Dalek Killer and Axel Pressbutton -- has an intriguing new novel on the way from Somnium Press, with Strange Attractor Press. A prominent inclusion in Iain Sinclair’s 2006 anthology London: City of Disappearances, Alan Moore’s biographical piece ‘Unearthing’ detailed the life of his friend and mentor Steve Moore, including the circumstances surrounding the writing of Steve’s debut novel, Somnium. A jewelled whirlpool of a tale, Somnium - a 288 page book which includes an afterword by Alan Moore, wrapped in a glorious cover by John Coulthart - is described as a richly poetic pagan fantasy, a narrative of shifting levels presented in a dazzling array of styles, ranging from that of the mediæval romance through Elizabethan tragedy to the Gothic novel and the sublime madness of the Decadents. With its delirious and heartbroken text spiralling out from the classical myth of Endymion and the Greek lunar goddess Selene, we're told Somnium "is an extraordinary odyssey through love and loss and lunacy, illuminated by the silvery moonlight of its exquisite language." The book will be available in two editions: the standard book for £20, and an edition of 250 numbered books, signed by both Steve and Alan, which will cost £30, the latter only from Strange Attractor Press, shipping in the first week of November. Steve Moore has written comic strips for 2000AD, Marvel Comics, Radical and other publishers in the UK and US, authoring innumerable characters including Doctor Who (most famously creating Abslom Daak, Dalek Killer), Dan Dare and Hercules in a career lasting 40 years. He also wrote the novelisation based on the movie V for Vendetta and had a long-standing editorial connection with Fortean Studies and Fortean Times, to which he has been a frequent contributor since its inception. 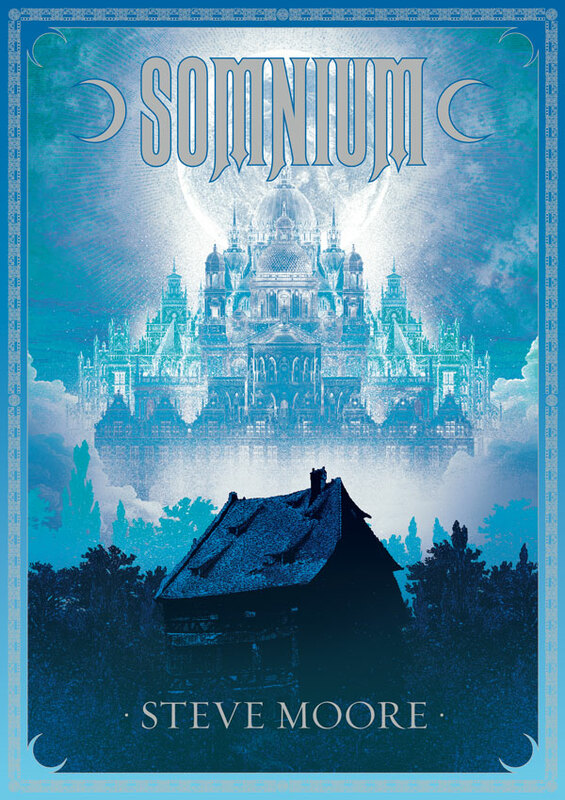 Alan Moore biographer and friend Pádraig Ó Méalóid is enthusiastic about Somnium's release, urging purchase in part because "Steve Moore is Alan Moore’s closest friend. They’ve known one another since they met in the early days of British comics’ fandom, back in the 1970s, when Alan was about fourteen, and Steve about seventeen. He’s also said to be the person who taught Alan how to write comics. "On top of that, they have also been magical partners for a long time. In both cases, Steve was the Teacher, and Alan the Neophyte... If there is one person on this Earth that Alan Moore looks up to, it’s Steve Moore. Which is very nearly a good enough reason for buying this book in itself. If Alan likes it, that’s good enough for me." He's in good company. "This book speaks for itself. It is a unique work by a unique genius," says Michael Moorcock. "Moore has an understanding of the occult peculiar to a very few and it always gives me the shivers; the shivers which say ‘authenticity’. The way their glorious predecessors said it. Maturin, James, Hodgson, Dunsany, Lovecraft, Lindsay, Williams, Peake appeal to a certain reader and have a sensibility in common. It fascinates you and puts you in thrall to a Romantic sensibility which refuses to be checked, hard as you try. Moore’s a proper dream merchant." Alan’s Moore's biography of Steve Moore, 'Unearthing', is available as an audio recording and a forthcoming book from Lex Records, and will shortly be released in app form, illustrated by photographer Mitch Jenkins. 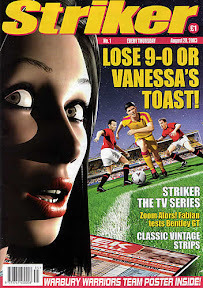 Football comics seem to be getting it in the neck this month - after the demise of the print edition of Comic Football (due to return online later this year), fans have alerted us to say that the official Striker comic web site and forum have now gone down. But don't be alarmed - the situation is only temporary, according to creator Pete Nash, who will be sorting out the problem, he hopes, in the next week, so fans will hopefully soon regain online access to the Striker strips. Responding to concerns over the site's problems has also prompted Pete to reveal some tantalising hints that the strip - which used to be published The Sun and Nuts - is about to step into the limelight once more, in some form. "As quiet as everything has been, there is a lot that has been going on with regard to Striker and the other projects, which I and the consortium I am working with hope will come to fruition by the end of the year," he told Striker fans. "Sounds cryptic, I know, but confidentiality issues prevent me from saying more." 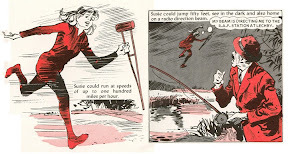 Researching a question from a downthetubes reader about a fondly-remembered British 'Supergirl', I came across Girls Comics of Yesterday, a relatively new fan site dedicated to British girl comics of the past, looking at three of the most long lasting publications of Bunty, Mandy and Judy. All three titles were published by DC Thomson, Bunty comic being the longest running publication, running from January 1958 to February 2001 and lasting for 2249 issues, as well as a short-lived Picture Story Library monthly series. It's the DC Thomson title perhaps most fondly remembered, with a campaign for a revival of girls comics centring on the name. 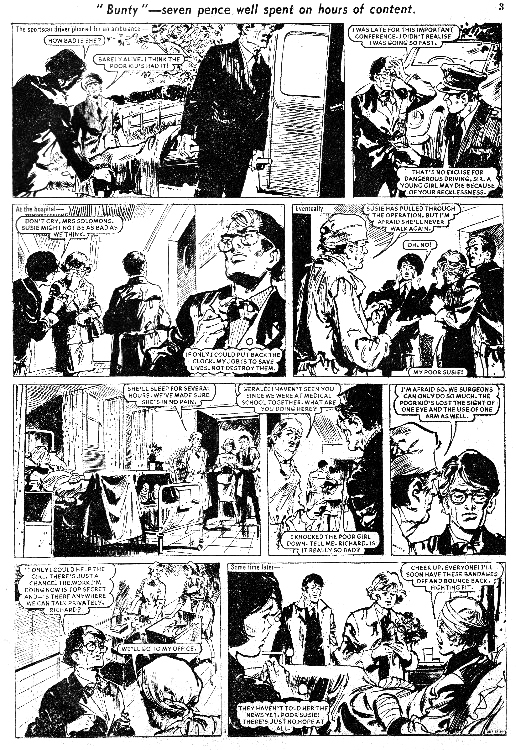 Judy ran from January 1960 and Mandy from January 1967 (DC Thomson seem to have a thing about launching titles in January and February), lasting 1635 issues and 1269 issues respectively. In 1991, Mandy and Judy merged with each other, then merged with Bunty in 1995. Some of their long running strips included 'The Four Marys', 'Lorna Drake', 'The Comp', 'Luv Lisa', 'Penny’s Place' and Valda, and Girls Comis of Yesterday is a growing attempt to document them all, including story lists and features. While the site had nothing on 'Supergirl' - the sample above was actually located on 'Stupid Comics' - it's definitely a resource that is surely going to grow and well worth book marking. As for 'Supergirl' - like many other girls characters, her fans have fond memories. From what our reader recalled, she was a schoolgirl named Susie Solomon who was hit by a car, and crippled. With a tip of the hat to 'Bionic Woman' (which had its own strip in Look-In for a time, drawn by artists such as John Bolton), the government then offered to rebuild her limbs with secret technology, in return for her services as a secret agent. The operations she had gave her bionic legs (enabling her to run at superhuman speeds) and an extra strong arm. She agreed to keep her abilities secret, keeping up the pretence that she was a cripple. Her crutch was actually secret tv radio - a way to speak to her superiors at HQ. While our reader recalled her appearing in Bunty, locating information about the character - who may also later have been published as 'Super Sue' (perhaps to avoid obvious copyright issues), longtime girls comic expert David Roach has been able to provide plenty of information, although he stresses that his research is open to challenge. Firstly, the 'Super Sue' cover of Bunty Picture Story Library 253, above, was published in 1984 and the cover looks like it was drawn by Rodney Sutton. This may not be 'Supergirl': there are earlier issues with a “Sue” in them, such as Issue 212, 'Singalong Sue' drawn by Carlos Laffond and 222, 'Sue and the Smiling Dolls'. 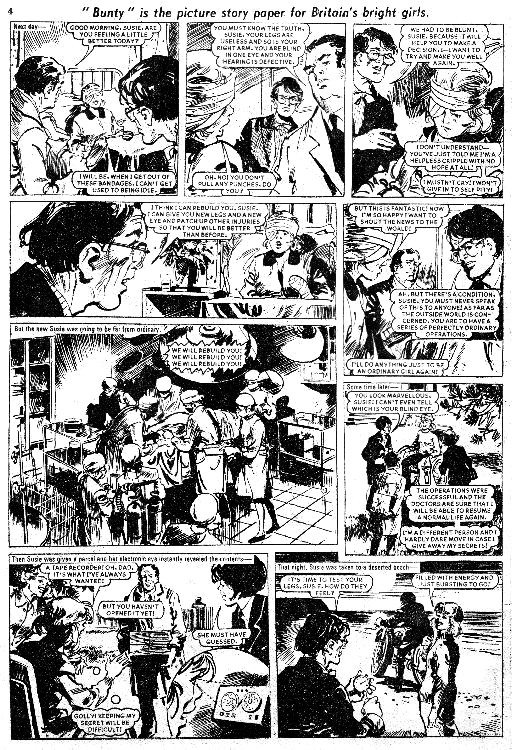 The annual story featured on Stupid Comics' - drawn by Douglas Perry who was a veteran of girls comics at D C Thomson, Fleetway/IPC and Pearsons - offered better leads and the revelation that the 'Supergirl' strip initially ran in Judy, not Bunty, first appearing In the comic with Issue 1217 (cover dated 7th May 1983) and drawn by Giorgio Letteri who was one of D C Thomson's most prolific and talented girls artists (principally on the long running Judy strip 'Bobby Dazzler'). Another serial called 'Part-time Supergirl' appeared later in 1983, ending with #1243 (5 11 83) also drawn by Letteri. "I’m not aware of any other 'Supergirl' strips after that, unfortunately, though there might well have been one or two appearances in annuals," he tells us - but also stresses that he can’t be 100 per cent accurate, so further information or samples would be welcome.